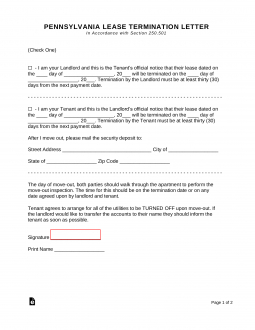 The Pennsylvania Lease Termination Letter Form (30-Day Notice) is a convenient legal document that allows the tenant or the landlord to provide appropriate notice, one party to the other, that it is their intention to vacate property and terminate the lease. This document will provide the 30 days notice to vacate required by the requirement of the contract and the law if the tenancy has lasted longer than one (1) year, if a year or under only fifteen (15) days is required. It will also provide an address for which the landlord may return the security deposit (or a portion of the deposit) to the tenant.